Local banks are hurrying to raise capital in order to improve their financial capacity and meet Basel II standards by 2020. The Ho Chi Minh City Securities Corporation (HSC) noted in a recent report that the Asia Joint Stock Commercial Bank (ACB) will likely sell its 41.42 million treasury shares to raise capital to improve its capital adequacy ratio (CAR) by the end of 2019. This is not only ACB’s target but also a common goal of other local banks this year, as Circular No. 41 from the State Bank of Vietnam (SBV), which comes into force from January 1, 2020, regulates that banks must have a consolidated CAR of at least 8 per cent, as stipulated under Basel II standards. Under this tight schedule, banks will need to improve their technology systems to calculate safety indicators as well as prepare capital to be ready for Basel II, but State banks are said to be under major pressure to raise capital. According to the National Financial Supervisory Commission (NFSC), the average CAR among credit institutions in the country has been consistently falling since 2017, standing at 11.1 per cent in 2018 thanks to the 12.2 per cent surge in owner’s equity capital and a 10.8 per cent rise in total risk-weighted assets. Regulatory Tier-1 capital to risk-weighted assets has thus been calculated at 8.8 per cent for 2018; a higher ratio than 2017’s 7.8 per cent. Experts have warned that when Basel II norms are applied, banks’ CAR will plunge due to an increase in the quantum of their risky assets. State-owned commercial banks (SOCBs) have an average CAR of 9.69 per cent; close to the stipulated minimum. Vietcombank (VCB) bears the least pressure because it has many options for raising capital while time is not limited. 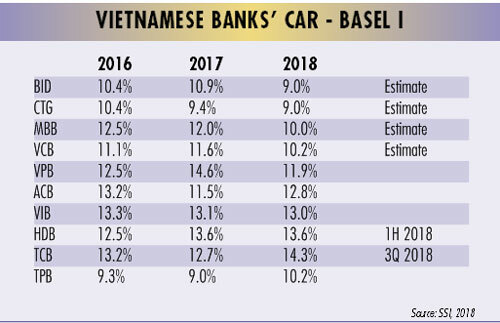 Vietinbank (CTG), meanwhile, needs to improve its CAR soon and increase its Tier-1 capital more than Tier-2 capital. Of the three SOCBs, BIDV (BID) has the lowest CAR, with no more room to increase Tier-2 capital, so has the fewest options for raising capital. In the case of BID and CTG, according to Viet Dragon Securities Corporation (VDSC), their CAR under the previous regulation (Circular No. 36) approached 9 per cent already. It is more likely that these banks’ CAR, if calculated in accordance with Circular No. 41, will be below 8 per cent. However, the process of raising charter capital is still pending because of relevant regulations and constraints, while they still need to pay cash dividends to the State. At BID, a strategic placement to KEB Hana Bank was approved but is yet to go through due to complicated conditions in the stock market. CTG was under even stronger pressure when the issuance to new investors was found to be infeasible because the State’s ownership would have been below the allowed threshold 65 per cent, while the State does not intend to inject more capital into commercial banks. “Due to these difficulties, the two banks have asked for support from the State, such as removing the binding conditions of strategic issuance at BID or approving dividend payment by stocks for CTG,” said Ms. Nguyen Thi Thuy Anh, Research Analyst at VDSC. If approval for these suggestions cannot be obtained, she believes, CTG will need to wait until at least 2020 or later to raise capital, based on the development strategy for Vietnam’s banking sector, which mentions the government’s plan to reduce its ownership in SOCBs to 51 per cent. Otherwise, BID and CTG can still improve their CAR temporarily by restructuring their asset portfolio towards less risky categories along with writing off bad debts and booking general provisions. Considering the deadline on CAR under Basel II standards, banks will have a busy year mobilizing capital in 2019. The capital injection is not only to meet the minimum requirements in CAR per the new regulation but also to ensure that banks will have sufficient capital buffers for comfortable growth in the following years. Most listed banks have been paying stock dividends instead of cash dividends, to increase charter capital and retain capital within equity. Only a small number of banks paid cash dividends (MBB 6 per cent and HDB 13 per cent in 2018). However, the size of the stock dividend is limited within the scope of retained earnings and share premium, according to Ms. Nguyen Thi Thuy Linh, Research Manager of Banking Sector at Saigon Securities Incorporation (SSI). Banks may issue new shares to foreign investors by way of private placement, she suggested. This method was successfully leveraged for large capital rises in various banks in 2017 and 2018. However, SOCBs had difficulties raising capital this way. State ownership at CTG has already reached the minimum 65 per cent and can’t be cut further, while the foreign ownership limit has already been reached. Therefore, additional share issuances by private placement is impossible for CTG. At the same time, the selling price must not be lower than the assessment price and the market price, making it difficult for VCB and BID. For VCB, the bank can only successfully issue new shares to GIC and Mizuho in early 2019 after a long wait for the market price to reduce to the benchmark price. In addition, Ms. Linh sees that issuing new shares to existing shareholders is a method that few banks have applied, including OCB and LPB, because of the limited financial capacity of existing shareholders. SOCBs can’t do this because the policy of the government is not to contribute additional capital into any banks under its ownership. In order to increase Tier-2 capital, according to Ms. Thuy Anh from VDSC, banks can issue bonds and certificates of deposits or engage in loan facility agreements with international financial institutions, with a tenure of at least five years. On one hand this method can be proceeded with quickly, but borrowing long term can increase the cost of funds, and the contribution to Tier-2 capital of the debts will gradually decrease when the maturity period is less than five years. Moreover, there is a constraint that banks can only raise Tier-2 capital to as high as 50 per cent of Tier-1 capital. However, she added, the process of raising Tier-1 capital at SOCBs is more complicated, as the decision is heavily dependent on the government. In the case of VCB, the bank could only issue one-third of the shares offered in 2018, so the issuance plan still needs to be continued in 2019, despite the bank gaining approval to apply the CAR under Circular No. 41 and Basel II. Vietnamese banks will achieve a further improvement in profitability because of wider net interest spreads and lower credit costs, which in turn led to improvements in asset quality, because they utilized profit growth to write off remaining problem legacy loans, said Ms. Rebaca Tan, Analyst at Financial Institutions Group at Moody’s. “Credit growth will stay stable over the same period because of tighter control by the SBV, and asset quality will improve further, as banks continue cleaning up their balance sheets,” she said. However, a Moody’s report also noted that most banks would still lack sufficient capital to meet Basel II requirements taking effect in 2020, so raising capital, primarily from foreign investors, due to the underdevelopment of the domestic capital market, would be a key focus for banks in 2019. Moody’s points out that despite banks’ improved financial health, greater competition to attract private investments would make it more challenging for Vietnamese banks to raise capital this year. Earlier, Fitch Ratings also said Vietnam’s banking system could face a capital shortfall of almost $20 billion, equal to 9 per cent of GDP, to meet Basel II and to increase allowance coverage to a level that reflects underlying asset-quality problems. It forecast that banks were likely to step up capital issuance over the next 18 months, which could improve the credit profiles of rated banks if it resulted in a meaningful and sustained increase in capitalization. However, a lack of depth in the domestic capital market could create challenges, particularly as some banks were close to or at the limit for foreign ownership.